Check the temperature of your wood stove using a wood stove thermometer to make sure it is around 350 degrees Fahrenheit. If it is hotter, open the oven door to cool it down and if it is cooler, add some small twigs to heat it up. In a large bowl combine the water, oil, yeast and sugar. Set this aside and allow the mixture to rest for 15 minutes while you prepare the other ingredients. Add 2 cups of the flour, the salt, and the egg to the yeast mixture and stir to combine. Add the remaining flour ½ cup at a time making sure to mix the flour into the dough before adding more. Separate the dough into 18 equal sized sections. Place the dough balls into a cast iron skillet. They will be close together and this is ok.
Let the dough rise in the cast iron skillet for 10 minutes. Cover the cast iron skillet with a domed lid. Place the cast iron skillet in the oven and bake for 10 minutes. Remove the lid and continue baking another 10 minutes, or until the tops are just golden brown. Once the tops are golden brown, remove the cast iron skillet and place it on top of the cast iron oven to brown the bottom of the biscuits. This takes about 5 minutes. 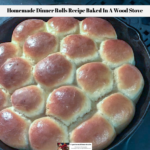 Note: If your cast iron oven is hotter than 350 degrees Fahrenheit, the time for baking this homemade dinner rolls recipe is going to change. For example, if the oven is closer to 400 degrees Fahrenheit this recipe might be done in as little as 10 minutes.